For Christmas 2017 a series of vibrant wreaths are available, which have been individually handcrafted by artists from Erub Erwer Meta, a remote arts centre on Erub (Darnley Island) in the Torres Strait. The Great Barrier Reef was the inspiration for these whimsical pieces featuring colourful woven coral and glossy pieces of shell. 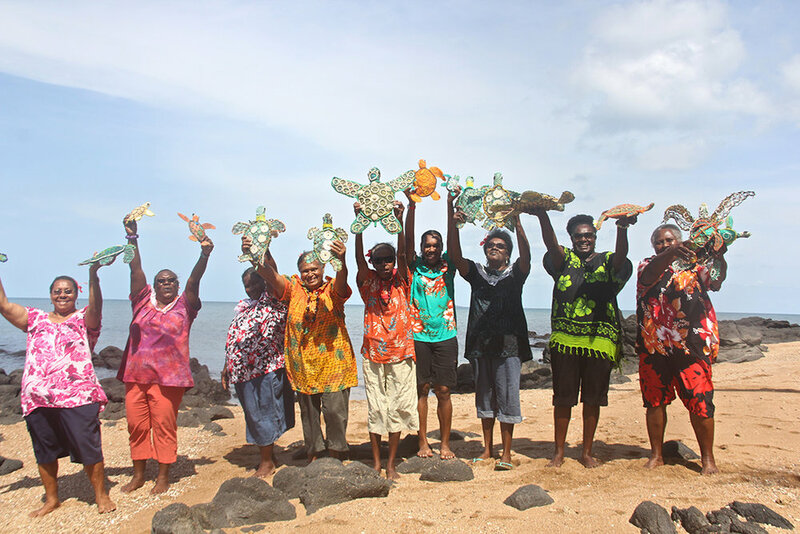 Koskela was keen to collaborate with the Erub artists who use ghost nets in their work. A major marine pollutant, ghost nets are fishing nets that have been lost at sea or discarded by the fishers when they have become damaged. These nets float aimlessly with the ocean currents drowning any wildlife in their path and eventually washing ashore. Turtles are especially vulnerable with researchers estimating that 4,000-10,000 have been killed in the past decade. Artists from Erub Erwer Meta deconstruct these plastic nets to produce brightly coloured fibres that are woven into incredible artworks, such as extravagantly detailed reef panels and sea creature sculptures, which have a powerful embodied message. To introduce the ghost net issue to a new audience, Koskela commissioned the artists to apply their unique craft to Christmas wreaths, which are currently on display in the showroom. While conveying an important message, these Christmas wreaths are intended to be a uniquely beautiful decoration that will bring a smile for many years to come.